We worked with a Football League club who were struggling to sell advertising and sponsorship to local businesses, partly because they weren’t getting enquiries through their website. It took them 3 days to make the changes we recommended. By the end of the season they had already sold out advertising and sponsorship for the following season. We worked with a multinational PLC that wanted to increase sales. 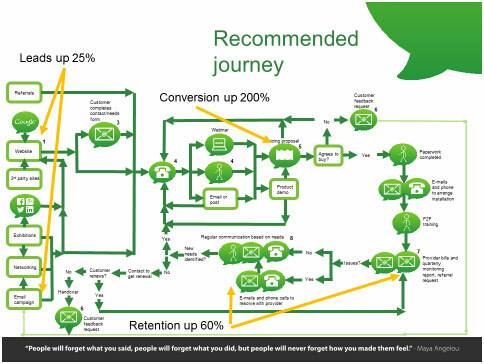 We mapped the journey customers took to buy a product, found out where they were losing sales and helped them make one change to their sales process. Sales increased by 30%. Because the changes we made were small, they could deliver them within a week- look at the effect they had! We worked with a national PLC that was worried about customer retention. By mapping the customer journeys we worked out where and why they were losing customers and helped them make some changes. The number of customers leaving halved giving the business £148m extra profit the next year. I would like to personally recommend the services of Nigel Greenwood at Simply Customer for helping my business map, understand and improve our customer experiences. If you’re in business and you care about how your customers perceive you then talk to Nigel! Here at The Design Mechanics, we’re one of the 80%+ who already ‘think’ they deliver good customer service … yet with the insight gained from Nigel’s ‘customer journey map’ we were able to identify three simple areas that could be easily modified to improve the customer experience. Not only did we gain this insight, but it also brought a focus to everyone’s mind about ‘what might the customer perception be’ of ‘x’. This general awareness drives further positives into the service we offer and this can only ever be a great side effect. So … regardless of how ‘sure’ you are that you deliver great customer service, consider talking to Nigel, getting your customer journey mapped and then utilising the information and feedback to further improve and enhance (or fix) customer service levels! Nigel Greenwood from Simply Customer has enabled me to see how I can improve the customer experience and attract more potential clients to the business through his “Customer Journey Map”. As a business owner it is often difficult to identify your own shortcomings and Nigel’s experience and gentle probing enables you to see where systems and methods can be modified to benefit the sales process from marketing through to customer handling. Having met Nigel at a networking event I was immediately impressed by his genuine passion for helping companies improve how they communicate with their new and existing customers. Following a brief introductory meeting in which we discussed our current route to market, how we work with new and existing customers and how we maintain these relationships. Nigel then joined us as a team to talk through the current customer journey. Once we had gone through the exercise Nigel went away and sent us across a clear vision of the current customer journey as well as what he perceived as issues with the current web design, route to markets and customer retention procedures. He then supplied us with a document showing much cleaner vision of how the journey should look and a clear route to help encourage new customers to interact with us but also help us allow existing customers to get more pro-active communication from us. A lot of Nigel’s recommendations were quite eye opening as well as being very clear and concise. He listed the key points in detail but due to his personable nature non felt like a personal attack on how the business has run in the past. Nigel was introduced to me by a mutual friend and tbh I was very sceptical that he would be able to bring anything to the table, after spending 30 minutes with Nigel on a quiet one to one, my opinion was completely changed. Having had Nigel come in and “interview” the team the report that he has produced has been incite full and extremely useful, I am convinced that some of the small changes that have been pointed out will have massive impact in a very positive way. I expect to be using Nigel’s services at some point in the future, once these changes have been introduced and the impact measured. Thank you for your quick response to my request to ‘Journey Map’ a client. It certainly helped in ratifying the areas of concern for the client and provided a clear set of recommendations to help drive his business forward, the information gained will be used in any ongoing plans. Thank you for your professionalism in handling the issue and should the need arise again in the future, I will certainly use the service again.